In April, I asked the female literacy students what they wanted to learn. As a public health educator, I am always ready to give our women health training. This time, unanimously, all three classrooms of students requested training in NUTRITION. That was definitely on my mind, since I had just completed conducting 2 week Positive Deviance Nutrition training in Wolayta, a town also in SNNPR. On the training day, the pavilion filled up with 100 women. After explaining the 3 food groups, the women divided the food appropriately. I explained the 3-color test is a simple way to see if the meal is mixed and balanced. Normally, across the world, white food is the standard and you don’t mix other items with items, out of cultural norms and convenience, not particularly poverty. 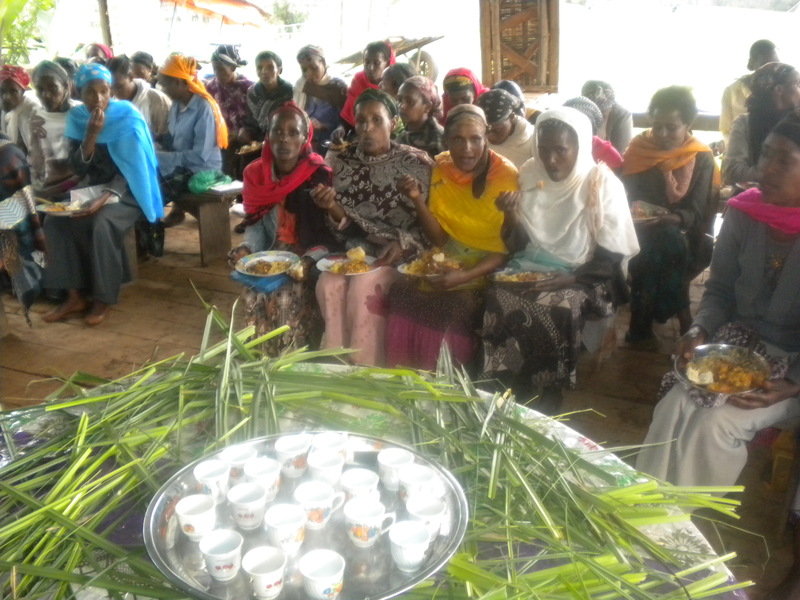 After the food was divided up, the women’s task was to make a big “Stone Soup” where we would prepare the various foods on the table. We gathered all the knives and basins and the women set off to make a meal. Groups of women were chopping 2 kgs of onions, others were peeling 2 kgs of garlic, others cleaned 5 kgs of potatoes (and NOT peeling them as I instructed…all the vitamins are in the skin! ), a group was chopping 2 kgs of ginger, another group was chopping the tomatoes, kale and carrots. Pots were brought out of our school kitchen and soon there were 3 fires started in the yard, using 3 stones for the pot and wood as fuel. One pot was boiling lentils, one pot was boiling potatoes and one pot had a mix of oil and garlic, ginger and onions, along with 2 kgs of berberi, their local red chili powder. When the meal was ready there was a HUGE pot of the vegetable stew, and another big pot of lentils. There wasn’t a pot large enough to combine them together. It looked like we could feed the entire Ethiopian army as it was grew to become a voluminous amount of food. 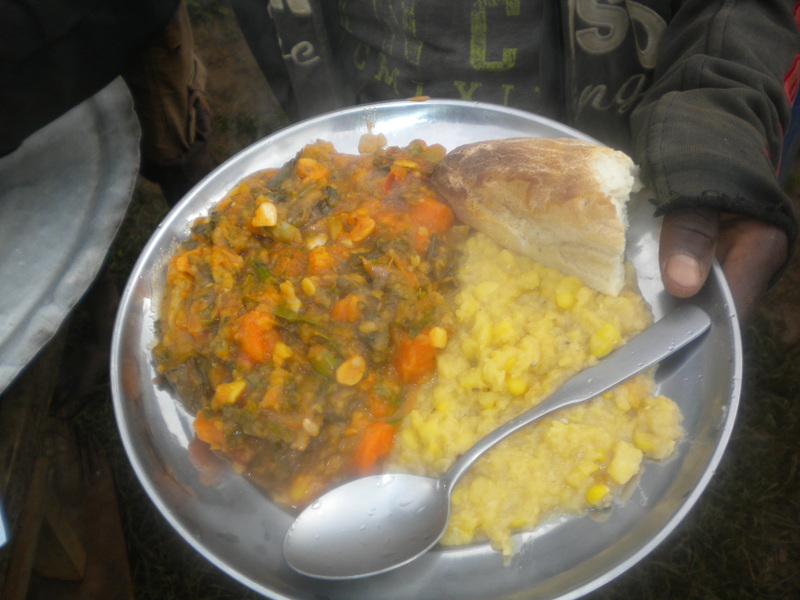 We started the feast and each woman got a plate with a mountain of the veggie mash along with a hill of lentils. We had freshly baked bread from our new cob oven, so everyone got a few pieces of bread. After the first round, the pot hardly had a dent in it. Then a second round was served and the women consumed as much as their first helping. They finished off the entire pot of food which was absolutely delicious! Too many cooks doesn’t always spoil the broth. Combined effort makes cooking so much fun and fast! If I had prepared the meal or our staff, the women would be reluctant to try it, much less like it. Traditional palates as a rule are not adventurous. But, when the participants invested in it and knew what was in it, they loved it. Creating a balanced, high protein diet is not expensive. It cost under $50 to feed 120 people (our staff included) and they all ate tons. Proteins can be inexpensive…no meat necessary. Usually, we have a feast with a goat or a cow, which is a few hundred dollars. This was purely vegetarian, as many of the women were fasting. The recipe can be tried at home. 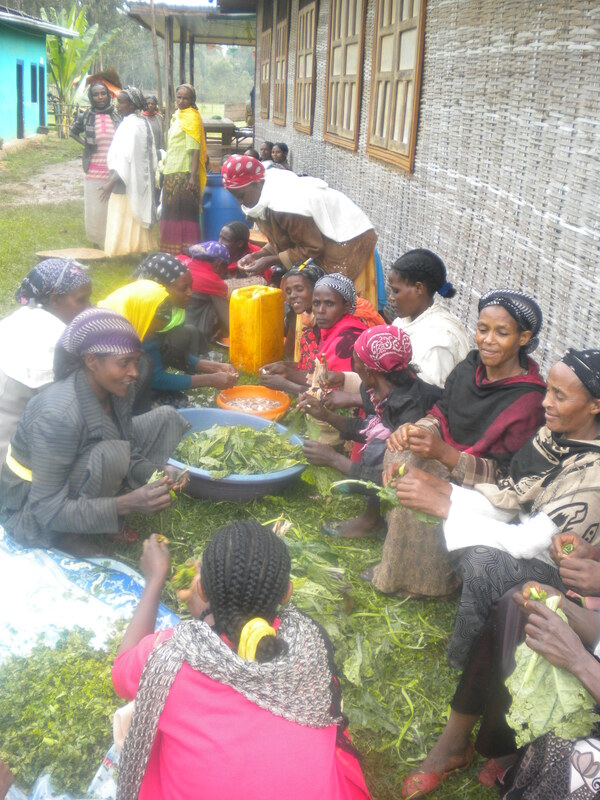 Women said they would do it at home as they have kitchen gardens and love the new recipe. Our female students are hungry. We have a school lunch program and we feed our primary students. We do not feed our female students. We need to do this type of feast more often! This entry was posted in Uncategorized on April 27, 2013 by Common River.